Needlepoint canvases from photographs can be more difficult to stitch. We recommend using less than 20 colors for less experienced stitchers. If this is a gift, please check with the recipient on what mesh count they prefer to work with. 18 mesh has very small holes and can be difficult to see, 14 is the most common and 12 mesh is better for someone who’s eyesight is not as good as it used to be. "On the eighth day of Christmas, my true love sent to me, Eight Maids A-Milking . . . " We all know this fabulous and familiar holiday song "The Twelve Days of Christmas"; with each verse describing a grand gift given by "my true love" on one of the twelve days of Christmas. The magic of Christmas! A time to spread cheer, reconnect with family and friends, and to create memories and traditions for years to come. Stitch and create your own holiday keepsake. Twelve individual blocks in the collection; one for each of the twelve days. This listing is for "Eight Maids A-Milking" as block number eight. A great project for the beginner or expert alike. Every block is the perfect size, not so overwhelming, and makes for a great "on the go" project. 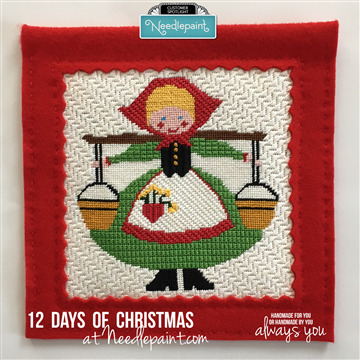 Designed by our very own Peggy Bond, we invite you to read her blog post for beautifully detailed stitch ideas, as well as ideas for finishing each of the twelve day blocks together.